September 19, 2017 -- Landscape Wildlife Ecologist, Dr. Craig Thompson, works to interpret scientific research for the purpose of engaging the public and other stakeholders for direct, tangible on the ground conservation results. Rooted in a desire to avoid organic chemistry class, CBI’s Dr. Craig Thompson shifted from a physics major to the study of ecology during his undergraduate years at UC San Diego. “I truly hated organic chemistry,” he said. Though he stumbled into the field of ecology, he found his footing after graduation working on the Channel Islands as a technician, initiating island fox surveys and feral cat radio tracking. His education at UC San Diego emphasized theoretical science with a heavy focus on modeling, formulas and graphs. The Channel Islands opportunity gave Thompson the experience of getting his hands dirty. From the Channel Islands he transitioned to a more formal position with the National Park Service at Badlands National Park in South Dakota, working on a black-footed ferret reintroduction effort. Those experiences in the field convinced him that science could have direct, tangible results. One of the “disturbances” Thompson studies is the devastating effects of illegal marijuana grow sites. Thompson has helped document the ecological impacts on wildlife in national forests throughout the western US as well as national parks such as Yosemite and Sequoia Kings, and says the public is largely unaware of the industrial scale or lethality of the toxins used on these illegal grow sites. Illegal growers divert, drain and dam waterways to irrigate water intensive marijuana plants. They clear patches of old growth forest to plant seedlings, poisoning wildlife and waterways with banned pesticides and spreading poison up and down the food chain. Armed drug cartels set up camp for the season, covering the forest with trash and “eliminating any living thing that might affect their crops”. The USFS produced a video documenting the shockingly destructive and dangerous affects of illegal marijuana cultivation, highlighting the work of Dr. Gabriel Mourad and Dr. Thompson. Beyond documenting the ecological impacts of illegal marijuana grow sites, Thompson works to educate the public and raise awareness of the issue by getting stories published in high profile news outlets like the LA Times, NPR, the Atlantic, and BioScience. An additional role Thompson plays is as technical advisor and science translator for the Dinkey Collaborative Forest Landscape Restoration Project, a multi-stakeholder group including industry, local landowner, non profit, and California Native American Tribes, that implement the federal Collaborative Forest Landscape Restoration Project on the Dinkey Landscape in California’s Sierra National Forest. This kind of facilitation work is not something Thompson ever imagined he would do but finds the role rewarding. “We all have a stake. We all have a right to have our voices heard. Yet very few people are willing to actually engage in a dialogue. They generally want a monologue. That conflict between those ends of the spectrum make things very difficult on the ground.” Dinkey Collaborative, Thompson says, is a way to have a multi-stakeholder conversation with science guiding their decisions as they try to forge a path forward and make progress together. He’s also served as a technical advisor for wildlife-related issues to numerous organizations and efforts, including the Blackfoot-Swan Landscape Restoration Project in northern Montana, and the California Academy of Sciences. Thompson’s current work involves the development of resiliency-based forest management regimes in both the Sierra Nevada and Rocky Mountain regions. His blended background of landscape and wildlife ecology, combined with facilitation and advising enables him to tie together scientific research with the social side of management and conservation to produce clear and tangible results on the ground. 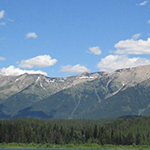 CBI is assisting the US Forest Service, Region 1, with reconciling habitat conservation efforts with long-term forest resiliency planning in the northern Rocky Mountains.